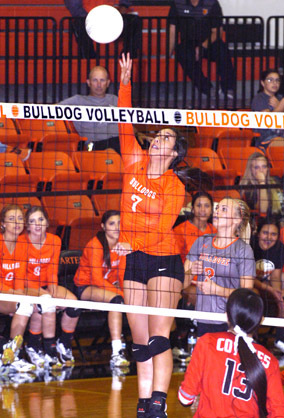 Down two games to one to Roswell High Tuesday at Bulldog Pit and trailing 6-4 in the fourth set, the Artesia High School volleyball team had a decision to make: Buckle down or suffer their first District 4-AAAAA defeat. The Coyotes were riding high on the momentum gleaned from a comeback victory in Game Two that subsequently sparked the go-ahead win in the third bout. But the Bulldogs weren’t about to let the match slip away without a fight. 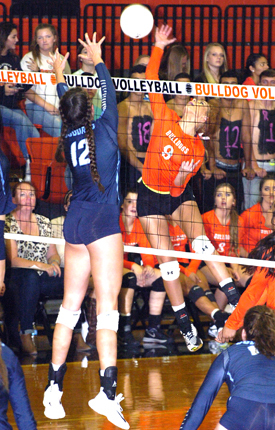 With a two-point service by Mattie McCombs and a pair of Gracie Puentes kills, the ‘Dogs inched in front in Game Four, and with Bailey Pearce and McCombs delivering well-placed spikes, Alexa Riggs was able to tack on three more from the line midway through to make it 15-10 Artesia. As Puentes posted a kill, McCombs a block, and Pearce found open court to expand that cushion – 18-11 – it was clear the girls in orange were getting their mojo back. And after a string of side-outs that took the ‘Dogs over the 20-point mark, 21-17, Stacia Martinez would serve out the set, with Malori McSpadden putting down a block for game point, 25-17. It was precisely the boost the Bulldogs needed. A Pearce kill and Elliot Harrison ace to kick off the fifth set illustrated that fact further, as Artesia continued to tighten up their play. Martinez, Puentes and McSpadden came through with successful hits to keep the Bulldogs in front through a contentious midsection, and two more Pearce points and one from McCombs gave the ‘Dogs the slight edge they needed, 12-9. A defensive error allowed the Coyotes to pull within two, 12-10, but Roswell’s final service sailed wide, putting the ball in the hands of Kacey Thurman, who followed a Pearce kill with a resounding ace to end the threat and the match, 15-10. And with that, the Bulldogs (16-1, 3-0) capped off an unblemished run through the first round of district play, 25-16, 22-25, 22-25, 25-17, 15-10. “It was a tight one, but I think it was good for us to have a tough game at this point,” head coach Alan Williams said following the contest. “I really would’ve liked to have finished it in three, but I think that first game was kind of like fool’s gold for us. The ‘Dogs had gotten the match off to a solid start Tuesday, taking advantage of quality hitting by Pearce, McCombs, Puentes and Martinez and an overall solid defensive performance. A trio of service points from Harrison put Artesia up 8-3 early, and three more from Riggs late made it 19-12. Harrison’s second service of the bout resulted in a pair of aces to take the ‘Dogs to 22, and kills from Martinez and McSpadden ended the game, 25-16. The girls in orange were again in control early in Game Two, and the Coyotes seemed on the ropes, struggling to establish any sort of rhythm. Some untimely unforced errors, however, gave Roswell the opening they’d been seeking. With Artesia up 22-21, a hit into the net returned the ball to the girls in red, and a pair of defensive errors and a net call later, the Coyotes had pulled off the win, 25-22. Buoyed, they took control down the stretch in the third set, maintaining a two- to three-point lead over the ‘Dogs through the latter goings. Kills from Puentes and McCombs were able to bring Artesia back within one, 23-22, but two more defensive errors stopped the comeback there, as Roswell logged an identical 25-22 decision. “I was really pleased with the way we passed the ball and our serve-receive,” said Williams. “That was our best serve-receive game of the year, I think. Pearce finished with 18 kills on the match for the Bulldogs, followed by Puentes with 13 and Martinez with 12. Riggs had 17 digs, Harrison 29 assists and Gonzales 27, McSpadden three blocks, and Harrison three aces. The ‘Dogs will now open the second round of regular-season district play at 7 p.m. Thursday against Lovington at Bulldog Pit before hitting the road Oct. 24 and 26 versus Goddard and Roswell.